Orwell is the most modern and yet most distant writer of our age. He has integrated the challenges of the contemporary era into the socio-political tensions of all times, those captured by the Hugos, the Lamartines, the Dostoyevskys. Those which consist of a peace Nobel prize boasting of his drone attacks to murder children~. At the same time, like a divinity, we have very little from him beyond the essence of his expression: his literature. No movie nor audio recording exist. Only images. Such, such were the joys. Those are truly unique testimonies of a period of history, of society, of the human mind and character. They are even more unique if you take into accounts other literary accounts with which they could be likened, such as those of Hemingway$^*$. Other works could also be qualified as such, like Burmese days, The Road to Wigan Pier and even Keep the Aspidistra Flying. His most famous creations, 1984 and Animal farms, have defined new standards in society and established long-standing paradigms. Those are really his biographies which make his work stand high and straight in the face of everything else which has ever been written. He was humane to the point of living the world, and talented to the point of writing Literature out of it, out of the mundane and the vulgar. He did, as Victor Hugo before him, transform the miserable into the beautiful and the majestuous, but he did that from first-hand knowledge, acquired from an actual thirst and hunger, from cold and deprivation of sleep, of money, from fear and sorrows. Each page of his biographies read for his readers like a personal experience. At the same time, he wrote some of the most exquisite and refined pieces, such as his famous A Nice Cup of Tea or his comments (to Senhouse) about the use of "onto", reproduced in the preface of some editions of 1984. He was a prolific writer, and left us a large body of work, which is lucky given his death at only 46 (!?). 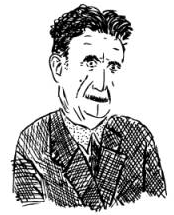 Stuart McMillen made the nice sketch of Orwell at the top of this page, for an illustration of Neil Postman's thesis that other evils prevail on the Orwellian ones, all the more dangerous as we are wishing them. This page was last modified on 17 June 2018, at 22:24. This page has been accessed 3,556 times.